1. Free reciprocal golf for members of both clubs. 2. £15 for any Guests of members who come along to play. 3. Proof of membership is required – Production of a Fixture List or Bag Tag to the starter. 4. Tee times subject to availability. 2. £10 for any Guests of members who come along to play. Half price Reciprocal green fees have been agreed between Callander Golf Club and those Golf Clubs listed below. 1. 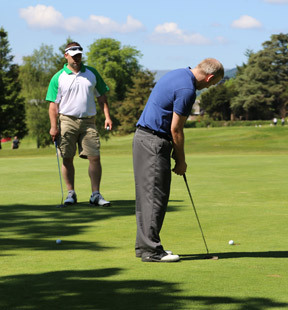 Callander will allow full playing members of the other club to play for 50% of the normal prevailing green fee (subject to any arrangements for winter green fees). 2. Times booked under this agreement are subject to availability and cannot be booked more than 7 days in advance. 3. Players must telephone and book a time stating clearly that they are booking under this agreement. 4. Players will be asked to provide proof of current membership, fixture book or bag tag. 5. This agreement cannot be used if visiting with an organised party. 6. Juniors are welcome under this agreement but must be accompanied by an adult.